American ginseng (Panax quinquefolius) is an herb said to offer numerous health benefits, including treatment of conditions like diabetes and cancer. Laboratory research shows that ginsenosides (compounds found in American ginseng) may stimulate the immune system and inhibit the growth of cancer cells. Like other forms of ginseng (such as Korean ginseng, or Panax ginseng), American ginseng has also been found to fight fatigue in preliminary research. However, the overall evidence for American ginseng's health benefits is limited to date. 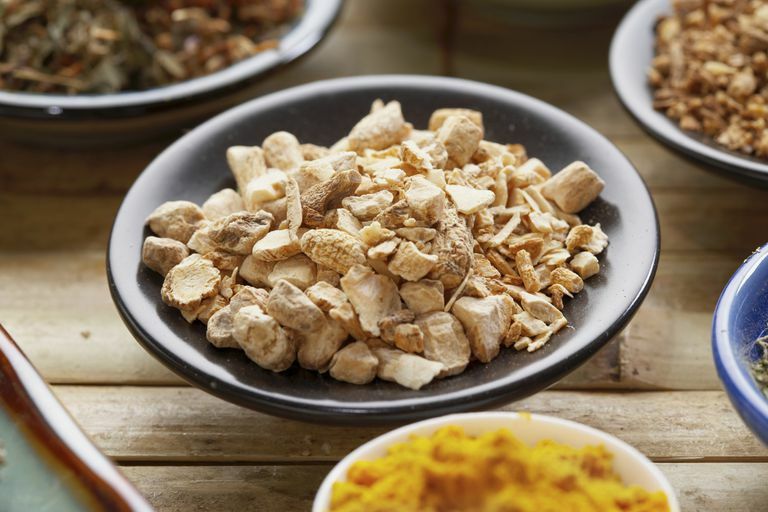 Here's a look at some key findings on American ginseng's health benefits. American ginseng may help regulate blood sugar, according to a 2000 study published in Archives of Internal Medicine. In a small experiment involving nine diabetes patients and 10 people without diabetes, researchers found that taking American ginseng supplements prior to eating helped keep post-meal blood sugar levels in check. Maintaining normal blood sugar levels is important for both diabetes prevention and diabetes management. However, it should be noted that there is a lack of larger studies testing American ginseng's effects on blood sugar. American ginseng may offer cold-fighting benefits, a 2005 study from the Canadian Medical Association Journal suggests. For the study, researchers told 323 adults to take two capsules of either American ginseng or a placebo every day for four months. Study results showed that members of the American ginseng group had fewer colds over the course of the cold season. When they did come down with colds, those given American ginseng had less severe symptoms and shorter duration of sickness (compared to those assigned to the placebo). In a 2010 study from Supportive Care in Cancer, cancer patients who took American ginseng supplements daily for eight weeks showed greater improvements in vitality (compared to those assigned to a placebo). Other research suggests that American ginseng may fight mental fatigue during prolonged mental activity (such as taking a test). Use of American ginseng may lead to a number of side effects, including insomnia, nervousness, rapid heart rate, headache, and low blood sugar. In addition, American ginseng may produce harmful effects when combined with certain medications (such as blood thinners and drugs used to treat high blood pressure). The long-term side effects of ginseng use aren't known. Due to the lack of scientific support for its health benefits, American ginseng cannot currently be recommended for any health condition. If you're looking to treat or prevent a specific health problem with American ginseng, make sure to consult your physician before starting your supplement regimen. Keep in mind that alternative medicine should not be used as a substitute for standard care. Self-treating a condition and avoiding or delaying standard care may have serious consequences. Barton DL, Soori GS, Bauer BA, Sloan JA, Johnson PA, Figueras C, Duane S, Mattar B, Liu H, Atherton PJ, Christensen B, Loprinzi CL. "Pilot study of Panax quinquefolius (American ginseng) to improve cancer-related fatigue: a randomized, double-blind, dose-finding evaluation: NCCTG trial N03CA." Support Care Cancer. 2010 Feb;18(2):179-87. Predy GN, Goel V, Lovlin R, Donner A, Stitt L, Basu TK. "Efficacy of an extract of North American ginseng containing poly-furanosyl-pyranosyl-saccharides for preventing upper respiratory tract infections: a randomized controlled trial." CMAJ. 2005 Oct 25;173(9):1043-8. Reay JL, Kennedy DO, Scholey AB. "Single doses of Panax ginseng (G115) reduce blood glucose levels and improve cognitive performance during sustained mental activity." J Psychopharmacol. 2005 Jul;19(4):357-65. Vuksan V, Sievenpiper JL, Koo VY, Francis T, Beljan-Zdravkovic U, Xu Z, Vidgen E. "American ginseng (Panax quinquefolius L) reduces postprandial glycemia in nondiabetic subjects and subjects with type 2 diabetes mellitus." Arch Intern Med. 2000 Apr 10;160(7):1009-13. What Conditions Can Benefit From Vibration Healing?